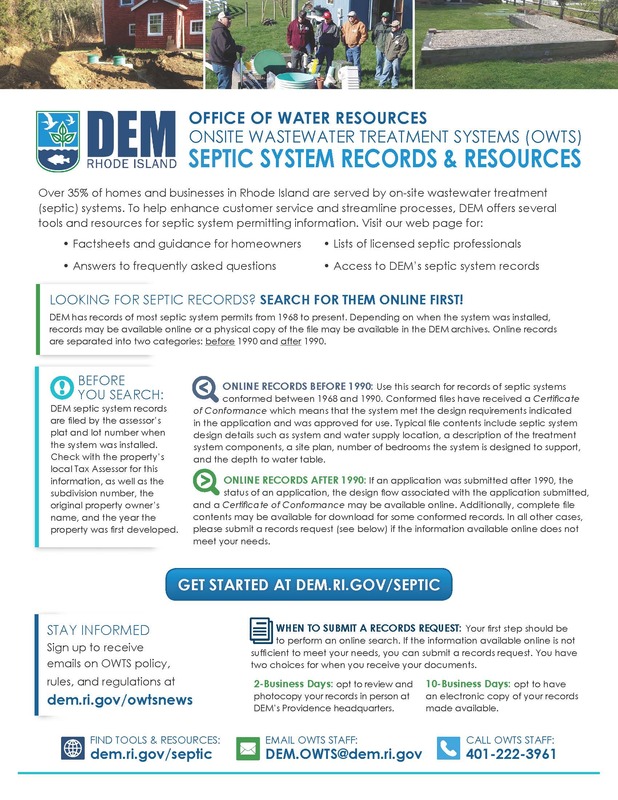 The Rhode Island Department of Environmental Management (DEM) has been awarded a $300,000 grant from the state-funded RI Information Technology Investment Fund (ITIF) for a project to further expand online access to onsite wastewater treatment system [OWTS] (or "septic system") records. A continuation of information technology improvements that began in the 1990s with several phases of enhancements, the new project builds upon recent efforts by DEM to provide digital access to historic OWTS records and Certificates of Conformance for systems conformed after 1990. These improvements are making it easier for property owners to complete the permitting process and/or retrieve historical files online, reducing the need for customers to visit DEM offices to access records in person. "We are thrilled to receive this competitive technology grant to enhance our existing OWTS online search tool to make additional information available electronically to customers," said DEM Director Janet Coit. "DEM is seven years into our Lean Government Initiative to become a more customer-friendly agency and this enhancement project is a terrific example of our commitment to a culture of continuous improvement. We already offer much useful property information online for constituents, and this grant will allow us to make it more convenient for time-pressed customers to access and obtain relevant information." The grant funds will be used to implement the next phase of OWTS digitization for online public access. This includes purchasing equipment needed to continue to scan and upload OWTS files upon customer request; improving existing online tools by consolidating separate before-and-after 1990 permit searches; preparing remaining archived paper files and imaging documents. The project is expected to be completed in two years, and file preparation is already underway. DEM will retain the services of a vendor through a competitive bid process to image the documents. Customers need OWTS records when they buy, sell, finance, build or add on to residential and commercial properties. Information is also critical in situations where an existing OWTS fails or needs repair, and the property owner needs to respond quickly to deal with that emergency. In Rhode Island, approximately 2,000 OWTS systems are permitted each year. Records are permanently retained and are available from 1968 through today. Currently, more than 55,000 OWTS files for systems conformed before 1990, and more than 50,000 Certificates of Conformance for systems conformed after 1990 are available online. Last year, more than 339,000 searches were conducted. Conformance is the final step in the OWTS permitting process and is required for a municipality to issue a certificate of occupancy for new construction or to complete an existing property transfer. Per Rhode Island law, OWTS cannot be used until a Certificate of Conformance is issued. For more information about the project, contact Jennifer Ryan in DEM's Office of Water Resources via email at Jennifer.l.Ryan@dem.ri.gov or by phone at 222-4700 ext. 7253. Visit DEM's website to search for information about water and wastewater permits. In addition to these online services, the DEM website also offers visitors the opportunity to complete a boat registration, apply for fishing and hunting licenses, conduct environmental site searches and much more. Visit www.dem.ri.gov/onlineservices for a complete list. Follow DEM on Facebook at www.facebook.com/RhodeIslandDEM or on Twitter (@RhodeIslandDEM) for timely updates.